With the release of Alice in Wonderland in theatres this week I thought you Old Guys might like to discuss the different ways Alice is interpreted. For you Old Queens surely this is a must read. The article looks at Alice as an indictment of 'new math' and imaginary numbers in the context of the age of Victorian Mathematics. "The 19th century was a turbulent time for mathematics, with many new and controversial concepts, like imaginary numbers, becoming widely accepted in the mathematical community. 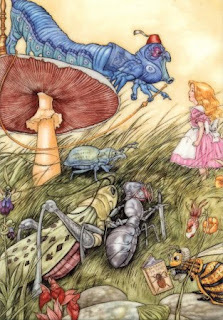 Putting Alice's Adventures in Wonderland in this context, it becomes clear that Dodgson, a stubbornly conservative mathematician, used some of the missing scenes to satirise these radical new ideas." I'm not great at math. In fact the mere mention of the name 'Euclid' makes me want to stab myself in the face with a blunt fork. Still ... esoteric analysis of fabulous children's literature can't be anything but good, right?